Thanks, Apple. I mean, it’s good to know that my expected Time Machine backup didn’t complete, but couldn’t you be a bit more helpful? Like, say, telling me which file(s) caused the problem, or which file(s) couldn’t be backed up? Until Apple fixes this flaw in Time Machine, you’re on your own. Savvy OS X users know you can get a better idea of what went wrong by opening the Console utility (in /Applications/Utilities) and searching the All Messages view for instances of backupd until you find one or more log entries containing an error. But for those looking for an easier solution, Carnation Software’s TM Error Logger can help. For example, I used TM Error Logger yesterday afternoon after my third Time Machine error of the day. 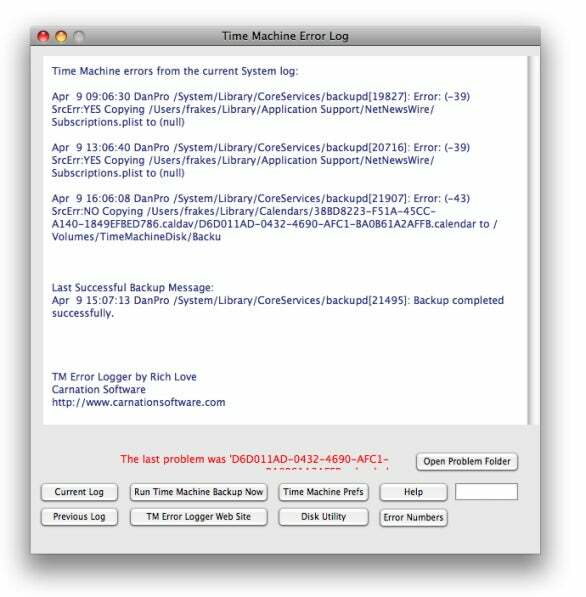 TM Error Logger’s window, essentially a filtered version of the aforementioned All Messages view, shows only Time Machine-related data—specifically, all errors so far that day, as well as the log entry for the most-recent successful backup. Each error message shows the path to the file that could not be copied or otherwise prevented your backup from completing. You can use these error messages in a couple ways. Sometimes—especially with frequently-updated data such as iCal calendar files—the problem is likely that the file in question was already in use. For example, a MobileMe sync was in progress, so a calendar file was being updated at the instant Time Machine wanted to back it up. If the next time Time Machine runs, it doesn’t have a problem with the same file, that means the file was successfully backed up and there’s no need for concern. On the other hand, if Time Machine repeatedly has a problem with the same file, there’s a good chance the file itself is damaged, or that your hard drive’s directory is having problems. If the file is unimportant, you can delete it and try backing up again to see if the error no longer appears. Alternatively, you can run Disk Utility or another disk-repair utility to see if it can fix the problem. Buttons at the bottom of the TM Error Logger window let you quickly refresh the current log; view the previous log (presumably the one from the previous day); manually start a Time Machine backup; open the Time Machine pane of System Preferences; view a list of common error codes; and more. One of the most-useful buttons opens the folder containing the most-recent problem file, making it easier to inspect or delete that file. While TM Error Logger is useful, it can also feel kludgy. Sometimes the Open Problem Folder button doesn’t work, there are some minor graphics issues with the program’s window, and its presentation of errors could use some polish. It’s also only as good as the logs OS X keeps.